Auchinleck Talbot's reward for beating Ayr United in the Scottish Cup is a last-16 away tie against Premiership side Hearts. Holders Celtic are at home against top-flight rivals St Johnstone while there is a Highland derby between Ross County and Inverness. Cowdenbeath or Rangers will visit Kilmarnock, and Hibernian host Raith Rovers. Aberdeen could meet Dundee if both win their fourth-round replays. The Dons visit Stenhousemuir and Dundee travel to take on Queen of the South on 29 January, the day before Cowdenbeath play their rearranged match against Rangers. Championship side Dundee United are St Mirren's visitors in the fifth round and East Fife welcome Partick Thistle. Talbot lost 1-0 to Hearts at Tynecastle in the cup in 2012 and forward Graham Wilson said of next month's tie: "Hopefully, we can sneak a win - you never know." Hearts narrowly beat fellow Premiership side Livingston in Sunday's live BBC television match and Tynecastle assistant manager Austin MacPhee said: "I hope it's an omen. 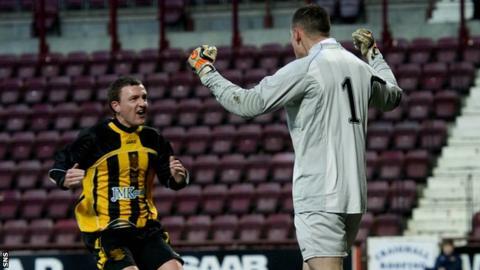 "On the way to winning the cup in 2012 Hearts beat Auchinleck 1-0. We can't take it lightly. We're pleased with a home tie and avoiding Celtic and Rangers in the early rounds. We've got a great record at Tynecastle and hope to progress to the next round."